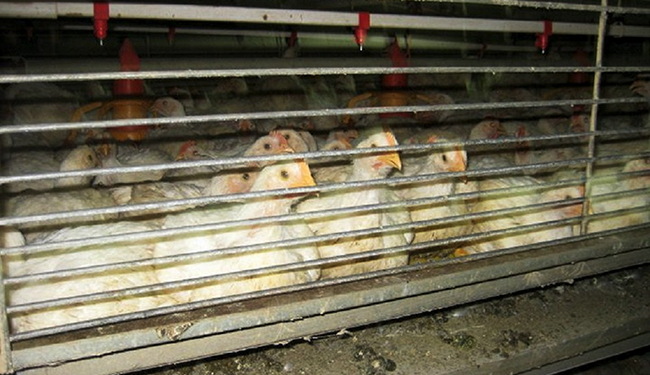 I saw egg-laying hens crammed into microwave-size wire cages stacked up to the ceiling. I saw pregnant sows confined to iron-galvanized steel crates. I saw chickens and turkeys that had gone lame because their bodies were too big for their legs to support. I saw all this when, curious about food production, I lived with factory farmers. The factory farmers were kind and warm to me, welcoming me into their homes, but they viewed their animals more as edible commodities than animate creatures. The animals were nameless, anonymous masses, carefully hidden from public sight in windowless warehouses. Their lives were miserable—stinking, sunless. Though my appetite vanished, I developed a thirst: I wanted to devise animal welfare solutions. Twenty-five years old at the time, fresh off Wall Street, I decided to leave the safe world of suits and spreadsheets and skyscrapers behind for the unpredictable, dangerous one of farm fields and factories. Switching my dry-cleaned skirts and high-heeled pumps for stained sweat pants and sturdy black boots, I launched into an international expedition. A small suitcase in hand, I investigated animal farms in eight countries: Canada, the United States, Mexico, Belize, Indonesia, Malaysia, Singapore, and the United Arab Emirates. I rode trucks and tractors, snowmobiles and motorbikes. I stamped and stacked, and raked and cleaned. I caught and caged animals, and herded and chased them. Mostly, though, I engaged in long, heartfelt conversations—hundreds of them—with farm workers, owners, and corporate executives. These individuals, I noticed, varied in many respects—ranging in income from minimum wage to millionaire, in language from English to Spanish to Mandarin to Malay—but the great majority of them, especially those who worked full-time, were men. The official data corroborates my experience. Only one out of every six full-time farmers, ranchers, and other agricultural managers in the U.S. is a woman, according to 2011 data from the Bureau of Labor Statistics. Just one out of every seven principal farm operators is a woman, according to the 2007 Census of Agriculture. Over the course of my conversations with men (and then more men), I began to wonder, what would be the effect of more women working in agriculture? Gender, of course, cannot be the only factor affecting the state of the industry (other important factors include limp legislation, rubber-stamp inspections, corporate hegemony, misleading labeling, and consumer confusion), but could gender be a factor? Another study, published in the journal Brain and Cognition in 2011, demonstrates that men and women differ in their capacity for compassion, defined as “a moral emotion related to the perception of suffering in others, and resulting in a motivation to alleviate the afflicted party.” The study is fascinating, as it shows that men and women differ not only in how they process compassion psychologically—but also neurologically. Women’s “brain processing” for compassion is more elaborate than men’s, resulting in “a greater emotional sensitivity in women when viewing aversive and suffering situations.” Women, the study finds, are especially responsive to “scenes of illness”—scenes that construct the background of most factory farms. Other studies conclude that women are more empathic than men, both psychologically and neurologically. In his Pulitzer Prize-winning book On Human Nature, scientist E.O. Wilson describes how interpersonal differences between men and women become evident as early as birth, with baby girls smiling more than baby boys, for instance. Men and women differ so much in their attributes and emotions that some researchers have even described them as possessing “two human natures.” Differences between men and women are thought to arise from divergent evolutionary sexual selection pressures in the areas of mating and parenting. Whether or not society is aware of the science on the differences between men and women, it overwhelmingly agrees with it. A 2008 Pew research poll of more than 2,000 Americans found that 80 percent believe women to be more compassionate than men. In addition, Americans rank women as more honest, emotional, intelligent, and creative than men, while being equally hard-working and ambitious. The differences between men and women extend definitively to their opinions on farm animals. Polls across the United States and Europe show that women are more concerned about farm animals than men, and are more likely to favor better treatment for them and to support increased protective legislation. Gender differences translate to eating habits as well. Women everywhere eat less meat and less fast food than men, and are more likely to be vegetarian than men. In addition, women are more likely to purchase organic food, think about food safety, and evaluate health, nutrition, and sustainability in making their dining decisions, according to the 2013 Food & Health Survey. Producer women seem to feel the same way as consumer women. The women I met in agriculture showed a clear preference for working on organic and small farms, which are more likely than factory farms to reflect the values of animal welfare, human health, and environmental sustainability. My conversations with agricultural men and women were starkly different. Men tended to discuss costs, breeds, feeds, technologies, companies—profit-minded concepts. Women, in contrast, preferred to talk about their observations of animals, their opinions of them, their experiences with them—more personal concepts. When I asked, as I often did, “What do you think of animals?” men would sometimes repeat, eyebrows raised, “What do I think of them?” Women, in comparison, often welcomed the question. Some of them expressed a “love” for animals. Women, I noticed, were also more likely than men to detect personality in animals, and to view them as individuals instead of entities. In addition to caring more about animals, the women I met were also generally more humane in their treatment of animals. Two women in Canada, for instance, both in their early fifties, expressed to me qualms about killing baby turkeys. The women were supposed to kill—or, as the industry calls it, “cull”—any baby turkeys that were sick or slow-growing, so that the animals would not continue to eat if they were unlikely to turn a profit. But both women had considerable moral trouble with the task, avoiding it as far as they could. “I have such a hard time killing them,” one of them told me. “I feel bad,” the other said. Not one of the husbands or sons of these two women, seven men in total, shared their feelings of hand-wringing guilt. They wrung necks with impunity. I saw a senior executive in Mexico, a patient, soft-spoken man, father of two girls, wring a chicken’s neck while he was giving me a tour of his corporation’s factory farms. Killing the chicken was not a bad idea in this case—the chicken was sick, lying on his back, his head somehow folded underneath his body, his legs lifeless in the air—but what struck me was how casually the executive killed him. He did not even seem to notice how the chicken flailed and flapped for several minutes—swinging his neck, moving his legs, fighting to stand—before eventually dying. Some say that gender in agriculture is dictated by the physical nature of the work, as it is in industries like construction and transportation. Though this was once true, it is no longer so. “The one and only good thing that’s come out of industrial agriculture is that farms today can have more women than before,” a cage-free egg producer in the U.S. told me. “Farming’s not like it used to be where you needed a strong back and a weak mind,” a farmer is quoted as saying in The Progressive Farmer. “Now it’s better to have a strong mind and weak back.” Of all areas of animal agriculture, it is actually the most manual, dairy, that women prefer. 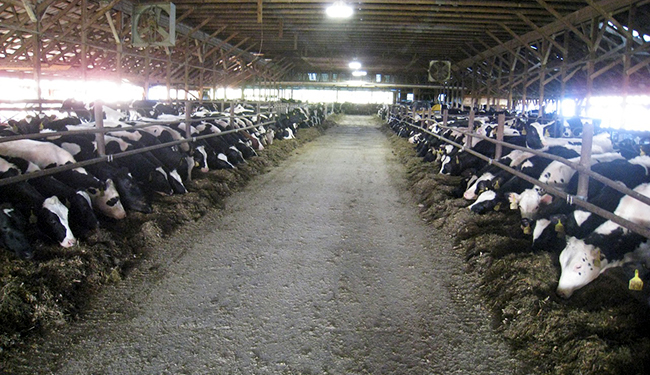 I encountered not one woman at the crowded, concrete dairy feedlots I visited in California, where the average herd size stood at more than 1,000 milking cows, but I encountered several on small dairy farms elsewhere in the United States and the world. On small dairy farms, women are able to interact with the animals. It’s not that all the women I met were humane or that none of the men were. Often, men and women were humane in some aspects of their jobs and not in others, or they were humane with some animals and not with others. Many workers had job descriptions that were so narrowly defined, and work environments that were so constraining, that their personal opinions could play little to no role in how they did their jobs. If women farm workers are a minority, women senior executives are a rarity. I did not come across one over the course of all my travels. My experience is reflective of the agriculture industry as a whole. Cal-Maine Foods, the largest egg producer in the U.S., counts just one woman on its 20-member leadership team. Tyson Foods, the largest chicken producer in the U.S., with chicken factories located also in Mexico, Brazil, China, and India, has one woman on its 12-member executive team. Smithfield Foods, the largest pork producer in the U.S., with pig factory farms located also in Mexico, Poland, and Romania, has two women on its 19-member executive team. Maple Leaf Foods, one of Canada’s largest agribusiness companies, has three on its 22-member management team. At these four multi-billion-dollar factory farm corporations, women cumulatively constitute less than 10 percent of senior executives. Women have been unable to crack through the “grass ceiling,” as some in the industry call it. Several farmers shared with me their fears that a disease would one day decimate their livestock in one swift, sudden, unforeseen stroke. Their fears are grounded, judging from the highly pathogenic avian and swine flu outbreaks of the last decade. The H1N1 swine flu of 2009, a potent assortment of human, pig, and avian viruses, killed up to 575,400 people, according to estimates prepared by more than 30 researchers, including nine from the U.S. Centers for Disease Control and Prevention (CDC). A distinctive characteristic of the 2009 swine flu pandemic was that it “disproportionately affected young people.” The H5N1 avian flu that emerged in Asia in 2003 killed 378 people, a startling 60 percent of all those infected, counting only laboratory-confirmed cases. It continues to kill, these days in Cambodia. In the meantime, a new strain of avian flu, H7N9, has also emerged, killing 44 in China this year. The worldwide swine flu pandemic of 2009 coincided with the worldwide economic meltdown. Michael Lewis, author of The Big Short: Inside the Doomsday Machine, a book about the Wall Street market crash, wrote in a 2009 Vanity Fair article: “One of the distinctive traits about Iceland’s [economic] disaster, and Wall Street’s, is how little women had to do with it.” His top recommendation for preventing future financial catastrophes is to fill 50 percent of risk positions in banks with women. Let’s extend Lewis’s 50 percent recommendation to agriculture: What would happen if factory farm corporations decided to fill 50 percent of their senior positions with women? In addition to animal welfare, there is a second reason to think that Cal-Maine would increase its cage-free egg output if it hired more senior women. The reason is Salmonella: the 2013 Food & Health Survey finds that women are more likely than men to believe that “food with Salmonella cannot be made safe.” Cage eggs are more likely to carry Salmonella than cage-free eggs, according to at least 10 comparison studies published in the last decade. In a July 2010 press release, the U.S. Food and Drug Administration (FDA) warned: “Egg-associated illness caused by Salmonella is a serious public health problem. Infected individuals may suffer mild to severe gastrointestinal illness, short-term or chronic arthritis, or even death.” Just four months later, in November 2010, Cal-Maine recalled a quarter million cage eggs because of Salmonella contamination concerns. If Cal-Maine were to switch a greater portion of its production from cage eggs to cage-free eggs, cases of Salmonella infection would likely decrease. This would be a significant stride for human health, as Salmonella is the most common foodborne bacterial illness in the U.S. and the most common cause of food-related death. FDA estimates that Salmonella-infected eggs sicken 142,000 Americans every year. If Cal-Maine were to fill half of its leadership team with women, we could probably expect improved animal welfare and human health. Cal-Maine’s sheer size, and the size of other factory farm corporations in the U.S., means that their leadership decisions impact farm animals and consumers throughout the country—and, increasingly, the world. One option for increasing the ranks of women in agriculture would be to start at the student level. As a university student, I often attended lectures organized by Women in Business, a student group on my campus providing career advice and mentoring opportunities. Agricultural schools could benefit from similar women’s student groups. Dedicated company recruitment efforts could also help; a new study on women in agribusiness finds that “just less than 20 percent of agribusinesses have programs to recruit women.” A third option for agriculture could be industry networking associations. Wall Street, for instance, has a few large women’s associations, including 85 Broads, consisting of 30,000 women, and 100 Women in Hedge Funds, consisting of 12,000 women. The American agriculture industry does seem to be starting to recognize the value of women, judging by the two annual women’s conferences—“Executive Women in Agriculture” and “Women in Agribusiness Summit”—that have cropped up in the last three years. Food will be safer, and animals will live better, if more women work in agriculture. Sonia Faruqi is the author of a forthcoming book about her international investigations of animal agriculture.